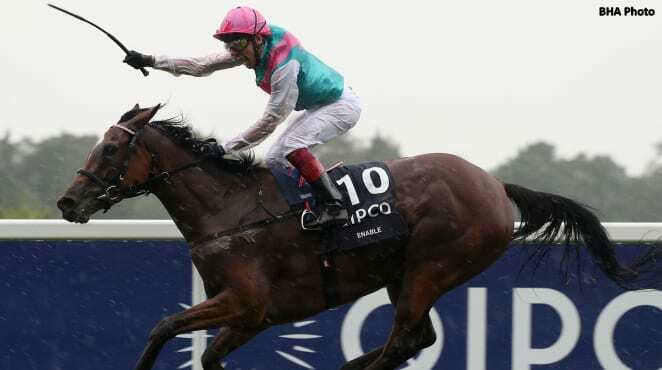 In order to ride dual Oaks winning filly Enable in Saturday's G1 King George VI & Queen Elizabeth Stakes, jockey Frankie Dettori had to lose a bit of weight – seven pounds in total, according to the champion rider. To make the weight, 8st, 7lb (119 pounds), Dettori did not resort to drastic measures. Instead, as the Racing Post reports, the rider kept himself on a strict diet throughout the week, which consisted of white fish and water. This entry was posted in People and tagged enable, frankie dettori, Horse Racing, king george v and queen elizabeth stakes, thoroughbred by Paulick Report Staff. Bookmark the permalink.